Jeanie Tailbury adores her desk with all its drawers and space for her globe, school bag, pencil holder, pencils, pencil sharpener and papers. 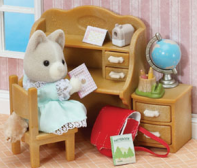 Most evenings she can be found sitting at her desk doing her homework, writing letters and drawing pictures for her favourite friends. Set includes dog sister Jeanie and all the furniture & accessories you see here.